and perform according to our fears." An ancient prophet once described a future Utopian world where all manner of prey and predator would live in peaceful coexistence under the leadership of a small child. Though I’m not sure I grasp the full meaning or symbolism of this prophesy, I’m intrigued by the notion of anything or anyone being led by a small child. Whether or not this is what the prophet divined, I believe there is a practical metaphor in this story. In a world where a lamb would feel safe in lying down beside a lion the notion of fear, as we know it, would be non-existent. In such a world—one in which fear does not exist—it would be fitting for a child to serve as its leader. Why? For the simple reason that fear, by and large, is a learned emotion that intensifies as we age. The older we get the more fearful we become, thanks to that prized state of being we call "experience" which teaches us to be cautious—which, truth be told, is the adult way of saying fearful. Don’t get me wrong, there are certain risks that are not worth taking. These you must decide for yourself—avoiding those that fail your personal pleasure-versus-pain test. But imagine what it would mean to live a life where courage was a greater emotion than fear—a life in which you do the things you really want to do rather than the things that are safe to do—a life where decisions are made on the basis of wanting or not wanting to do something, rather than having or not having the courage to do it. How would freedom from fear change the choices you make? The places you go? The fabric of your relationships? Your chosen career path? The hidden emotions you allow others to see? Your outlook on life in general? Though a fear-free life does not guarantee bliss, I have yet to meet anyone who can honestly say their life is better because of their fears. There is apparently no end to the types of phobias that can possess humans—an apt word that paints a picture of fear as an unwelcome parasite that takes up residence in your inner being. Perhaps the reason it is so difficult to “rid yourself of fear" is because Fear is in a battle to rid yourself of you! Given the opportunity, fear can destroy everything you love about life. Conversely, love, passion, and zeal are the enemies of fear. For this reason, I am convinced that fear is fundamentally a spiritual problem—since love, passion, and zeal are matters of the heart rather than the head. No amount of “psyching yourself up" can substitute for the kind of love that would compel you to enter a burning house to save a child—yet, we hear stories of such “irrational exuberance" almost every day. Love will always prevail over fear! Here’s what I suggest. If you want to overcome Fear, make friends with its natural enemies—not only love, passion, and zeal, but also a constant remembrance of how you felt during the times when you stood up to Fear and won. Fear hates defiance! Also, recognize Fear for what it is—an unwelcome parasite that feasts on your inner spirit. It is a force that can eventually destroy relationships, deplete vitality, and literally cut you off from the outside world—that big, "dangerous" place where "the forces of evil" are lurking in the shadows—shadows that eventually grow darker as experience teaches us to be ever more cautious. Franklin Roosevelt was on to something when he uttered those now-famous words, "We have nothing to fear but fear itself." If you truly want to "overcome your fears" don’t accept them as "your fears" in the first place. Furthermore, let your life experiences teach you how to be brave, rather than cautious. And, finally, remember to take control over Fear by giving it an unhealthy dose of its own medicine. I promise you’ll be emboldened all the more as you witness for yourself that Fear truly can be frightened away—and it doesn’t require super-human will-power to do so! 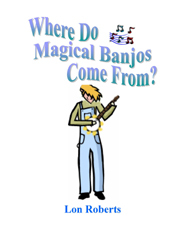 Where Do Magical Banjos Come From? Theme at a Glance: The "magic" we get is the magic we work hard for. Also, sub-themes pertaining to loyalty, ingenuity, and tenacity. Click here if you wish to inquire about ordering the book. This website is partially maintained through the generous support of those who benefit from our services and information. Secure contributions to the Pneuma Center may be made online by clicking on the Donate button.